One of the biggest concerns of today’s RVers is the cost of fuel. Although RV vacations are more affordable than traditional vacations, the cost of fuel can still take a chunk out of your wallet. To keep up with the needs of RVers today manufacturers are creating lightweight, fuel efficient travel trailers that don’t skimp on amenities and save on fuel costs. In today’s blog post we’re discussing 3 lightweight travel trailers that will meet your needs, save on fuel, and keep your family happy. The Passport Ultra Lite offers incredible value to families and couples alike. Whether you’re looking for a smaller unit for you and your spouse that can be towed by a crossover vehicle or prefer a bunkhouse model that fits the entire family, you will find something to love about the Ultra Lite. Each Passport is built using high quality, lightweight materials. With Passport you can go anywhere, without worrying about weighing down your tow vehicle. 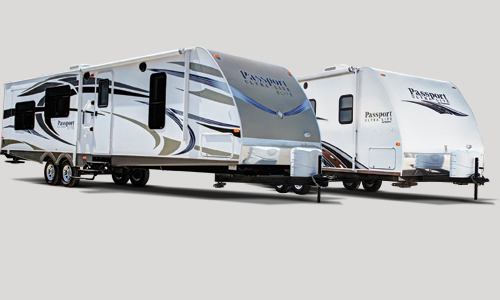 Aspen Trail travel trailers are designed with your family’s needs in mind. One of the main reasons people love this travel trailer is because of the broad range of floorplans available. Whether you’re a taller person searching for more headroom, looking for large windows and skylights to bring the great outdoors inside, or simply want the peace of mind that comes with buying a Dutchmen RV, you can’t go wrong with Aspen Trail. Cougar X-Lite truly delivers a high end living experience, all packed in a lightweight package. It boasts fully equipped luxury kitchens that allow you to whip up delicious meals, bunkhouse models that can even fit the entire family, and massive slide outs! With X-Lite you get high end living and a lower price point, along with unparalleled towability. If you are interested in learning more about our available lightweight travel trailers, check out our selection online or contact us. We will answer any questions you have and make sure you find the right floorplan for your needs. At Moore’s RV we aren’t a superstore. We don’t add extra costs while helping customers and are truly committed to making sure you find the right RV.